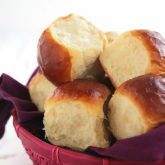 The fluffiest and most tender rolls you could possibly eat, kicked up a few notches! One amazing dough, three different fillings. There’s the creamy Nutella filled, the gooey mozzarella stuffed and the timeless classic good ol’ butter. The indecisive ones, who find it difficult to choose one thing over the other. The foodies who just want it ALL! These rolls make everyone happy. Not only because they offer something for everyone…but the rolls themselves, filling or not, are the best use of carb you could ever get. If you make them, which I strongly urge you to, expect to receive some awkward hugs, a few marriage proposals and several requests for the recipe. They are that HEAVENLY. They are the fluffiest, softest and most tender rolls I’ve ever tasted or baked, and as a carb-o-holic, I’ve really had my fair share. They just melt in the mouth…very little chewing activity is required. Just swallowing. I’m not the only one who thinks so. Anyone who tries them, just go bonkers for them and couldn’t stop at just one, and calls them “heavenly.” And that’s why I decided to name them that. I tried so many roll recipes, both dinner and crescent, before landing on this favorite. All the others were great, but this one is EXCEPTIONAL. I found the recipe over at Jacklyn from Cooking Classy, who’s one of my most trusted sources when it comes to yeast baking. She had never steered me wrong. I had nothing to tweak over the recipe (something I’m always guilty of) because really, there was no room for improvement here. The dough was already perfect. However, I decided to play with what goes in the rolls…because why have one type of roll when you can have three?! 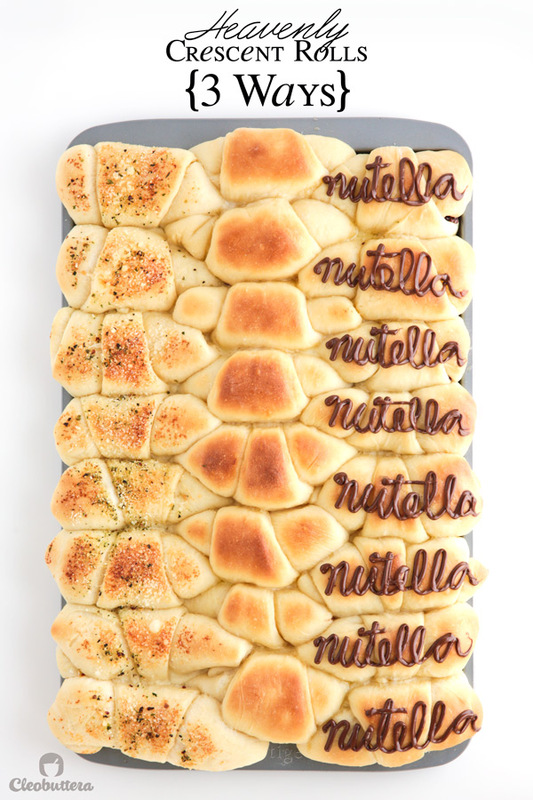 There’s the good ‘ol classic butter ones, ooey gooey cheesy mozzarella ones and Nutella lovers…I got you covered. The butter ones may sound a bit boring, but trust me they are anything but. Warm out of the oven, they will fall apart in your hands and transport you to cloud number 9 after the first bite.. Obviously they’re the perfect vehicle for soaking up gravies and sauces, or slathering with more butter. Or honey butter. Or cinnamon butter. Or peanut butter. Or…Ok I’ll stop now with all the butters. The cheesy ones are…I have no words really…because what can I say about melted cheese inside a little pocket of soft carb, sprinkled with parmesan and herbs. Its a given that they’re gonna be delicious. Just make sure you eat them warm though, while the cheese is still all melty. As for the Nutella ones…sooooo good! So basically you get breakfast, lunch and dessert all on the same platter. ‘Tis the platter of love, my friend. Let’s take a look on how you could make them. Prepare the dough following the recipe below and leave it to rise until poofy and doubled in size. Then dump the dough on a floured counter, and at this point, you might decide to stop right here and use the dough as a pillow. If you’d rather eat it, then gently flatten the dough into a rectangle and divide it into three equal parts using a pizza cutter or sharp knife. Then shape each section into a smooth ball. Take one of the balls, covering the rest with plastic wrap, and flatten into a 12 inch circle. Brush with butter then divide into 8 equal slices. Then roll away. Repeat the steps above of flattening, buttering and slicing then scoop about a tablespoon of Nutella on each slice. 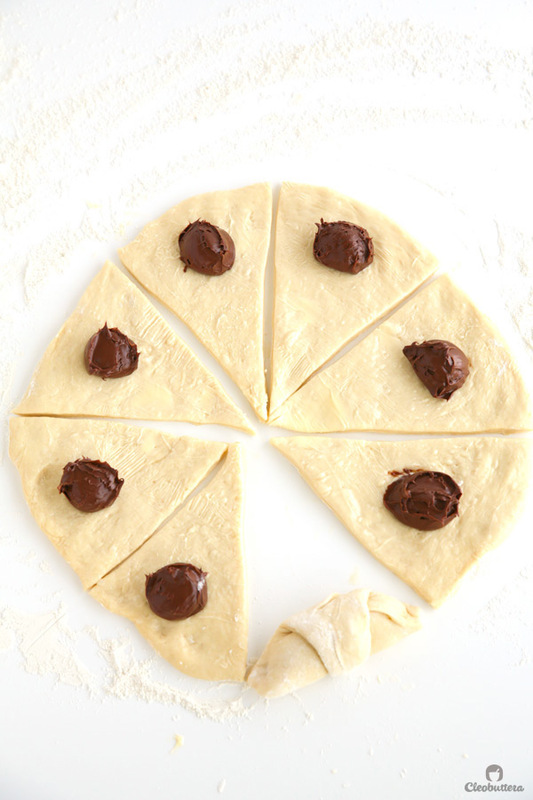 You’re gonna want to press the dough shut as you’re rolling to seal the Nutella in. 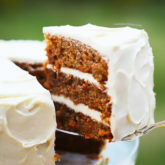 This will prevent it from oozing out during baking. Like so…kinda looks like a clock doesn’t it? Nutella clock…Is that a hidden message for its time for Nutella? Now onto the cheesy one. Plop some mozzarella on, doesn’t have to be shredded. And again, seal the dough as you roll. Make sure that when you arrange the rolls, you separate the Nutella ones from the cheese ones by placing the plain butter ones in the middle. You don’t want your cheese to ooze on your chocolate. Now JUST for the cheese ones, brush with olive oil, grate parmesan over it, then sprinkle with Itailan Seasoning. That just takes them over the top. Cover and let them rise again until they puff up and feel like the softest marshmallows ever. Bake until golden brown and enjoy as your house smells like a bakery in Paris. Immediately brush the tops with butter except for the cheese ones. These already got a bath in olive oil. This is completely optional but just gives it that extra touch, pipe the word ‘Nutella’ with melted chocolate over the Nutella ones, obvi. Or just make random drizzles and scribbles. Plain Jane? 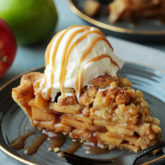 Ooey gooey? Or Chocoholic? The fluffiest and most tender rolls you could possibly eat, kicked up a notch! One amazing dough, Three different fillings. There's the creamy Nutella filled, the gooey mozzarella stuffed and the timeless classic plain butter. 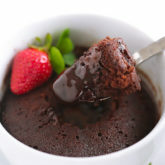 Whisk the water, milk, 5 tablespoons (71g) of melted butter and egg in a small bowl or liquid measuring cup; set aside. 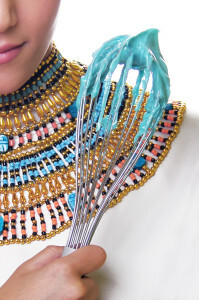 Whisk 2 cups (240g) of the flour, sugar, yeast and salt together in the bowl of a stand mixer. Pour the milk mixture into the flour mixture and stir until combined. Attach the dough hook to the stand mixer and on low speed, gradually add in the remaining 2 1/2 cups of flour. Increase the speed to medium low and knead until the dough is smooth, elastic and slightly sticky or tacky, about 4-5 minutes. The dough should only stick to the bottom of the bowl but pulls away from the sides. If this is not the case and the dough is still very wet, then add more flour, 1 tablespoon at at time until the dough clears the side of the bowl. Transfer the dough to a large oiled bowl and cover with plastic wrap. Allow the dough to rise in a warm place* until doubled in size, about 1 1/2 hours. Butter a 10X15 inches baking sheet and set aside. 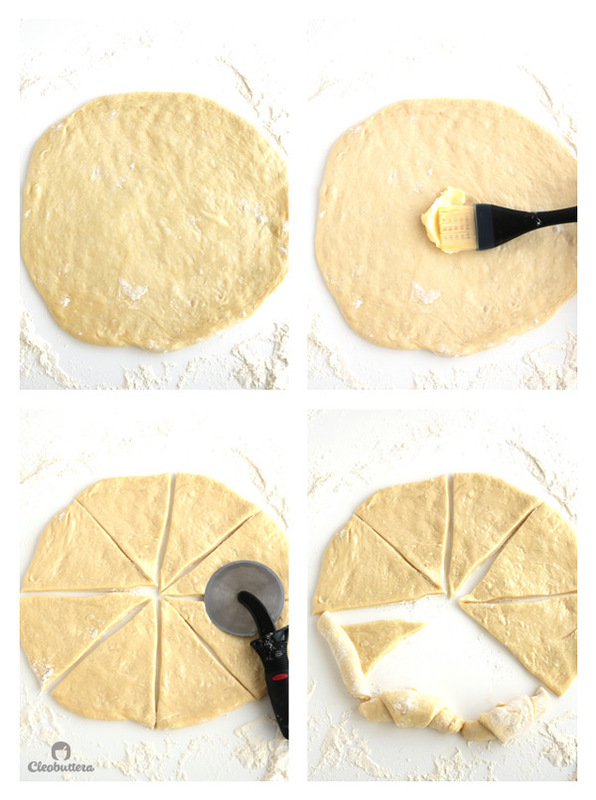 Transfer the dough to a well floured counter and shape into a rough rectangle. Cut into 3 equal portions. Shape each portion into a ball and cover with plastic wrap to prevent them from drying out. Take one of the balls and roll into a large circle, about 12 inches. 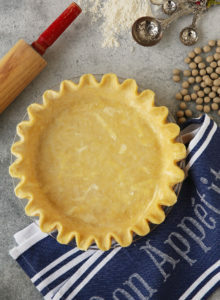 Spread evenly with 1 1/2 tablespoons of the softened butter then cut into 4 equal quarters. Cut each quarter in half to make 8 wedges altogether. Roll up each wedge starting from the wide (outside) edge, tucking the narrow end underneath. Arrange the rolls in the buttered baking sheet, fitting 8 in a row, making sure that the plain butter ones are in the middle. 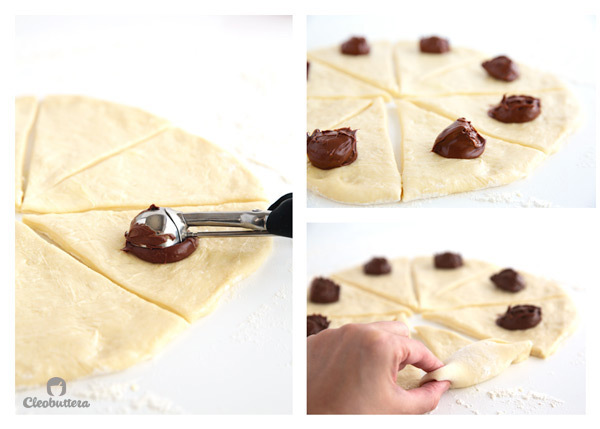 Follow steps 11 and 12, then scoop 1 tablespoon of Nutella on the wide (outside) edge of each wedge. Roll each wedge starting with the wide (outside) edge, using your finger to press the dough over the Nutella to seal it in. Arrange on the baking sheet, tucking the thin end underneath. Follow steps 11 and 12, then place about a tablespoon (1/2-3/4oz) of cheese on the wide (outside) edge of each wedge. Roll each wedge starting with the wide (outside) edge, using your finger to press the dough over the cheese to seal it in. Arrange on the baking sheet, tucking the thin end underneath. Brush with olive oil, sprinkle with grated parmesan and italian seasoning. Now you have 3 rows of 8. Cover loosely with plastic wrap and let rise in a warm place until doubled in size, about 1 hour. During the last 15 minutes of rising, preheat the oven to 375F/190C. Remove plastic wrap and bake the rolls for 15-19 minutes until golden brown. Remove from the oven and brush only the plain and Nutella rolls with the remaining 2 tablespoons of butter. 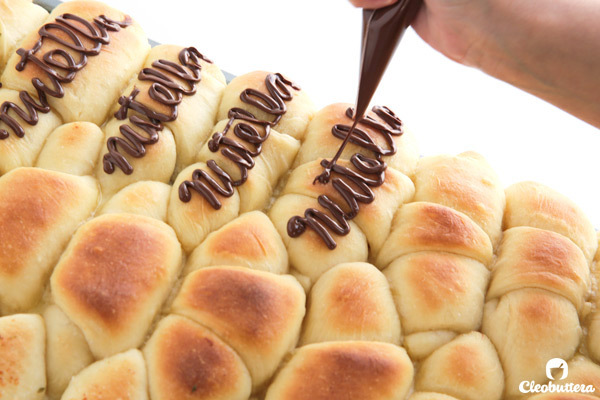 Optional: With the melted chocolate, pipe the word 'Nutella' on the Nutella stuffed rolls or make random drizzles or squiggles. Enjoy warm or allow to cool and store in an airtight container. Fresh out of the oven, they just melt in the mouth. Make sure you use 'instant' dry yeast here and not 'active.' Instant yeast is designed to get mixed right away with the dry ingredients without having to activate it in a warm liquid. 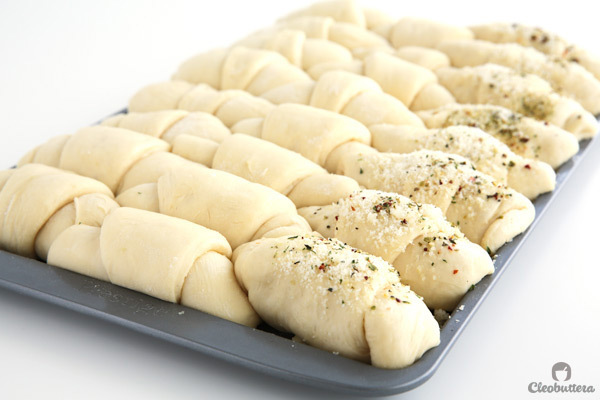 If you follow the same directions using 'active' yeast, the dough won't rise and you'll end up with thin, dry rolls. If active dry yeast is all you could find, then you're gonna need to dissolve it first in the warm water with a 1/4 teaspoon of sugar, before proceeding with step 1 of the recipe. The amount of flour varies depending on many factors including humidity and altitude. So start with 4 1/2 cups and slowly add more, if needed, until the dough is slightly sticky or tacky. It should stick to a clean finger then pull away without leaving dough behind. It shouldn't be dry either or the rolls will turn out tough. 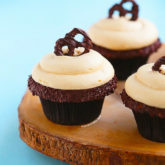 These look – and I’m sure taste – DIVINE! I can’t even! Your blog is addicting – the photography, writing, and recipes are amazing! I’m obsessed. Yara comments like yours are what give me the boost of energy I need to continue and push myself harder. I couldn’t be happier to know that you’re enjoying the blog and appreciating the labor of love that goes into it. Thanks for the support! Hi Amy! I’ve honestly never tried frying it to be able to give you a confident answer, but my guts tell me why not lol! I think this dough recipe is very close in nature to a brioche dough, which can be fried to make donuts, so I believe this one should work too. This exactly what I wanna hear! Come on do it! You won’t regret it. I’ll be right here if you need a baking buddy. Is there a certain flour brand that you reccomend? 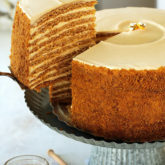 The recipe looks amazing.. Will try very soon! Thank you Laila! I really hope you give them a whirl! They’re so FLUFFY! I think I’ve said that too many times, but I can’t help it:))) I usually use El Doha for the flour. Please let me know how they turn out. Out of this world my friend.. enjoying every word n every recipe… feel I could taste them already.. keep it up girl! I’m soooo happy you’re enjoying this my fellow bake-a-holic:) Thanks for your continuous support. You are calling the baker in me…the one i have been trying to put to sleep for years hahaha! These look scrumptious! And loving your pics and collages and all these creative touches! U have to give me some tips 😉 well done!! Nohaaaaa!!!! Wake him up & unleash that monster! U won’t regret it. Well maybe ur thighs will:) I’m so happy you’re liking this…I’m still trying to figure out the blogging know-how, but I’m definitely learning new stuff as I go. I’m sure u feel the same way too. I love you’re blog and it would be my pleasure to share tips with u. Great post. Lovely pictures and loads of wonderful explanations. Thanks for sharing. Thanks Shamim for your sweet comment:) I’m so happy you liked it. This just gives me the boost to go on & on. These look amazing! Your pictures are beautiful to look at, and your writing style keeps readers engaged! You cannot tell that you’re a newbie to the blogging scene! I will be making this recipe soon, and I cannot wait to dive into a heavenly warm roll! I had a couple of friends over two weeks ago, and we had a baking date! 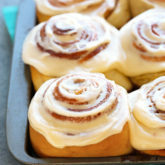 We made these rolls, and oh my, they were heavenly! My husband and I devoured our share that same day!!! Excited to try them again and stuff the cheese ones with sriracha cheddar filling!!! Thanks for the wonderful recipe! Nancy your comment is so adorable…no really…I have no other words to describe it:D I love it and I love the encouragement its giving me. I’m so happy to know that there’re some people out there who are interested as I am about baking and just love listening to lots of blabber about food. BTW if you subscribe by email, you’ll get notifications whenever a new recipe is posted so you won’t have keep checking FB. Love the food styling! One of the most beautiful tray of rolls I’ve ever seen! Oh Thanks Ramona! You’re comments always puts me over the moon. Actually there wasn’t that much styling done with this one. I tried so hard with putting them in a bread basket, plates, napkins, you name it, I’ve tried it, but there’s nothing I loved more than the look of them on the baking sheet. This is how we eat them anyway…straight from the oven, grab and go. No utensils whatsoever involved. I’m so glad you liked them and thanks for the pin! This looks amazing!! I need to try this soon! 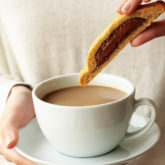 You don’t have to use Nutella at all; they taste great on there own without any additions. But if you really want to make a chocolatey one, then you could use any chocolate bar you have on hand instead. Play aroun with it. This recipe is pretty flexible. I butter after. Only the cheese ones get brushed with the olive oil before getting in the oven. Hmmm…That’s so weird. They shouldn’t take that long at all. Are you sure your oven is on the accurate settings? Its supposed to be 375F/190C. These look great! 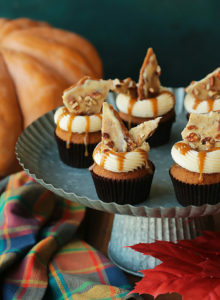 I will make these for Thanksgiving. I went to school for baking so I just love any kind of new, fun, and delicious food. Your photos are beautiful and your writing style is adorable. Can’t wait to see some more of your posts. Keep up the great job! Aaaawwww thank you for your sweet comment. Hearing that you’ll be trying one of my recipes is music to my ears. I’ll be here if you need anything:) Have a wonderful Thanksgiving! The food looks amazing and the instructions are the most elaborate I’ve ever seen. Wonderful blog, thnx a ton for sharing. Best of luck. Thank you thank you soooooo much! This is a sweet comment overload! I couldn’t be happier that these rolls turned so nice for you. I’m so happy you like these. About the Nutella hardening up, this never actually happened to me, it always stays so soft. But in general chocolate & Nutella start to burn and seize up if they stay in the oven for a long time. Could it be that you overbaked the rolls? Did they stay in the oven for more than 20 minutes? How about your oven’s temperature…could it be that it was too hot? Also next time try using cold Nutella, it could help with this problem. As for writing with chocolate. Did u melt the chocolate all the way? It looks like one of 2 problems, either the chocolate wasn’t warm & melted enough or the the complete opposite, which is that the chocolate got scorched during the melting process. Scorching happens when we don’t don’t stir the chocolate often enough as its melting, so the bottom gets burnt & hardens & seizes the whole thing. Chocolate can be very finicky sometimes. I’m sure you’ll perfect it next time. I usually find italian seasoning at supermarkets like Seoudi, royal house, Petro, Miriam market. If you still can’t find it, then any combination of dried herbs will work like dried basil, parsley, oregano, thyme, garlic powder, etc. Tasbih… I just made these n they were perfect! Thank you for sharing the recipe. I played around with the filling.. with one a cheese medley and some with cheese n sausage as well… the Nutella ones were lovely too… I guess my dough could have made more than this number cuz it rose very well… next time Id go for 30 instead of 24 rolls so they be slightly smaller n less doughy…. but really delish! I’m so happy you liked them Ingy! Those cheese and sausage ones sound amazing…I’m definitely gonna have to try them the next time I make them. I like the idea of making them smaller too; would be perfect on as a finger food. I am so glad you set up the recipe to be printed. I’ve been making crescent rolls for years, but this sounds so much better than the one I have. My son-in-law has celiac disease, the real thing, so he can no longer eat them. Have you ever tried to convert them using another kind of gluten-free flour? Thank you so much for sharing your wonderful recipe! They turned out beautifully soft and absolutely delicious….this is now my new favourite yeast dough rolls! Hey Tasbih, I missed you when you were gone and I am so glad you are back with AMAAZINNG recipes as usual. I was really busy prepping for Ramadan and I was wondering could I freeze this dough. ..so on that day I could just roll out and fill them up? I am all for doing less kitchen work in Ramadan. Please do let me know. Hey Fariha! It’s great hearing again from you:) Thanks for your kind words. 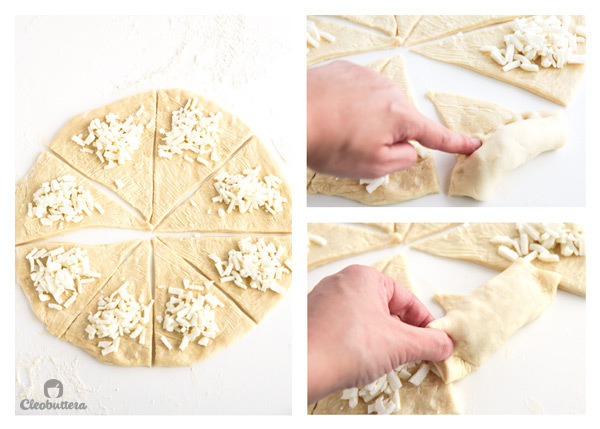 You could freeze the dough after you’ve shaped them and stuffed them. When you’re ready to bake them, just let them thaw & get its second rise then bake as you normally would. No prob :). 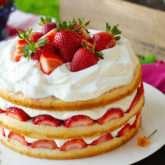 Can you please make a red velvet cake too? I havent gotten any good source and i think yours is the best. Only if its not a hassle. Sure. I’ve already had planned on working on developing a good one after Ramadan & the summer vacation:) Meanwhile, I have a pretty good one that I used for a different purpose here on the blog. You’ll find it under “imploding chocolate bomb of hearts.” Just note that it’s more chocolate-y that your average red velvet, but soooo good. Tried these todayy and the aroma that filled the house was just perfect! Everyone loved them but I got a comment that the dough was too “sugary” and I personally thought that this was weird because I did not get this feeling when I tried them so to avoid this the next time I make them, will decreasing the sugar affect the dough in any way? Aliaa I’m happy you tried these as I happen to be obsessed with them. Actually yes the rolls are slightly sweet, that’s how they are meant to be. I tend to love them that way, but if that bothers you or your tasters, you could try to experiment with reducing the amount of sugar by a little amount. You wouldn’t want to reduce it greatly as that will affect the end result. Tried these todayy and the aroma that filled the house was delightful! Everyone loved them but I got a comment that the dough was too “sugary” and I personally didn’t believe so, but to avoid this the next time I make them, will decreasing the sugar affect the dough in any way? I also played around with the fillings and stuffed some with chicken and cheese, and others with a mixture of kiri cheese, oregano, and olive oil, truly heavenly! So happy you stopped by and even happier that you’re enjoying it over here. Can I use this dough for other cheese types or for sn example zastar? Yes ofcourse! That would be amazing! Hi Walaa 🙂 I’m so happy you liked these rolls; I’m smitten about them. The extra spreading of butter does help them get more tender and soft, although I don’t think they’d suffer that much without them. As an extra insurance, just try not to skip this step the next time. As with most breads, these rolls are best enjoyed the day they are baked, but if you store them in an airtight container, they’ll keep really well the next day. Storing them in lightly covered containers or plates will cause them to dry out, so be sure they are well stored. What can I substitute for the Nutella? 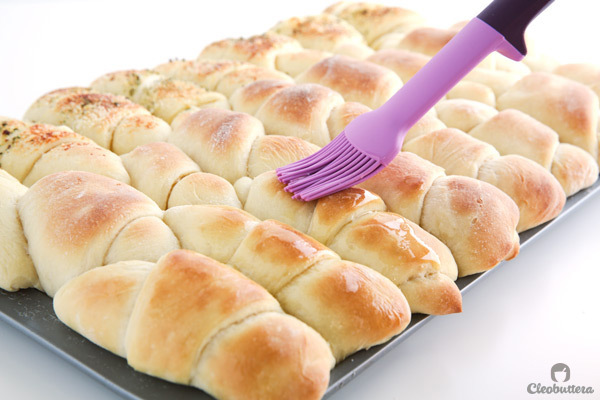 I can’t wait to make these rolls. Thanks. The great thing about these rolls is that you could customize them however way you want. You could use your favorite spread like pb&j or Biscoff spread. A piece of your favorite chocolate bar will work great too & will melt in the oven. 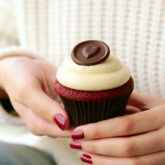 If you don’t want something sweet then try veggies, cooked ground beef or pizza toppings & sauce along with the cheese. The options are endless here. Salwa you’re sweet; I love you already😍 Thank you so much. That’s a HUGE compliment! I really do wish I had that notorious sense of humor Egyptians are known for. I’m so grateful you can see it in me. I’m really happy you’re enjoying the recipes and I hope to always keep it interesting for you. I’ve become a fan!! 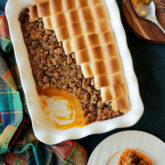 Another recipe i’ve added to my list of must try! i admire your work. masha’allah you are talented. Active dry yeast is all I have at the moment. So I dissolve it along with 1/4 TSP sugar in the 1/3 cup water stated in the recipe, and then when it’s foamy, I add in the melted butter and egg, correct? These turned out amazing, but the problem was they started to burn from the bottom but still look white from the top. I had the tray in the middle of the oven and the temperature set at 190. What I did was switch off the oven and turn on the broiler and that worked out okay. What do you think went wrong? I’m so happy you liked these Naela! I think the burnt bottoms could have to do with the type of baking sheet you used. Was it dark and/or thin? Darker pans tend to overbrown baked goods; try to stick with light colored pans for even baking. It was black actually … Because that is the baking sheet that came with my oven. Would it work if I just covered it with baking paper (wara2 zebda)? Also, where do you buy baking sheets from? So sorry for all the questions! Ok so that explains it. The one the comes with the oven is not ideal for baking on it. It serves more of a rack purpose than a baking sheet. They are so dark and so thin and get super hot that they’ll burn the heck out of your bread or cookies, etc. Adding parchment paper wouldn’t help that much, because the sheet itself tends to heat up really hot. If you bake a lot, I highly recommend investing in some light colored, heavy baking sheets. 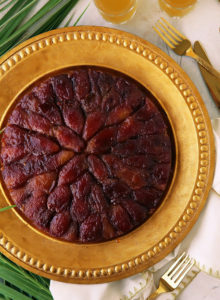 The one I use for this recipe is Prestige brand, which I got from Carrefour. You’ll also find a lot of really good quality baking sheets at Tulip. 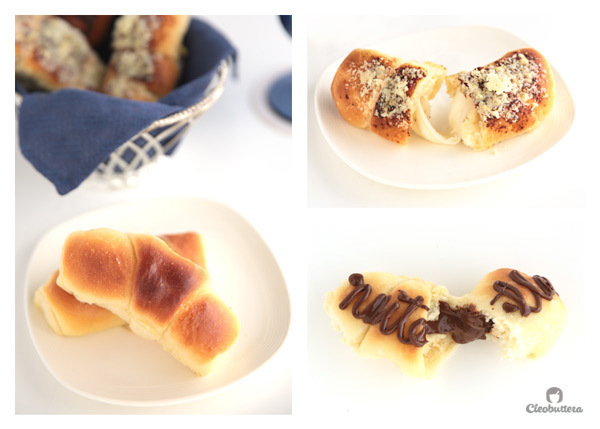 I tried these rolls last time and THEY WERE TRULY AMAZING!I made the butter and nutella ones and both were a hit but we did prefer the butter ones slightly more because my nutella kind of seized up.Maybe it is because I skipped the cheese ones but my nutella rolls were hugee! Soo fluffy in the middleee and absolutely perfect! Thank you so much I will definitely make these again! Where can i send you some pics? It’s so good to hear that you loved them Hermain! So weird that the Nutella seized up though…do you think you might’ve overbaked them? Because the longer the Nutella stays in the oven, the higher the chance that it will dry out. Yaaaaay I love seeing pictures! You could either email them to me at cleobuttera@gmail.com or if you have a public Instagram account, you could hashtag them #cleobuttera or DM them to me if your account is private. Hahaaa😄 It’s ok as long as it doubles in size. Depending on the yeast brand and your environment’s temperature, the dough can rise in less (or more) time than recommended. Oooohhh! Niiiiice! Thanks for the tip. Id like to ask if I can prepare the dough a day ahead before stuffing it , or is t better to also prepare all with the filling and bake it the next day! Hi Walaa! Both scenarios will work just fine. You could either make the dough & let it get its first rise in the fridge overnight then fill, shape, proof again & bake the next day. Or do all the work the day before, cover, refrigerate then give its second rise and bake the next day. Do whatever is more convenient for you; either way they’ll be yum! dad gummitt…you went and gave me an idea! First of all, your recipe is really good. But you went over the top by “filling” these! With Nutella and cheese. So, I think why not orange marmalade (or any preserves) or a cinnamon, butter & brown sugar paste and then drizzle them with a glaze! Yeah, you’re filling these got me started! Would this be ok ? Should i take it out of the fridge an hour before i need to fo the filling or early morning? And akso for the fluffy milky break dough? Can i apply the same as well? Hi Walaa. It’s preferable that you fill them today & bake tomorrow since the dough has already risen. It will continue to rise in the fridge if you don’t fill them today. You could fill & shape them today, cover them & refrigerate, then take them out of the fridge tomorrow 1-2 hours before you plan to bake them for the second rise. Same goes for the fluffy milk bread, shape into rolls, refrigerate then proof & bake the next day. 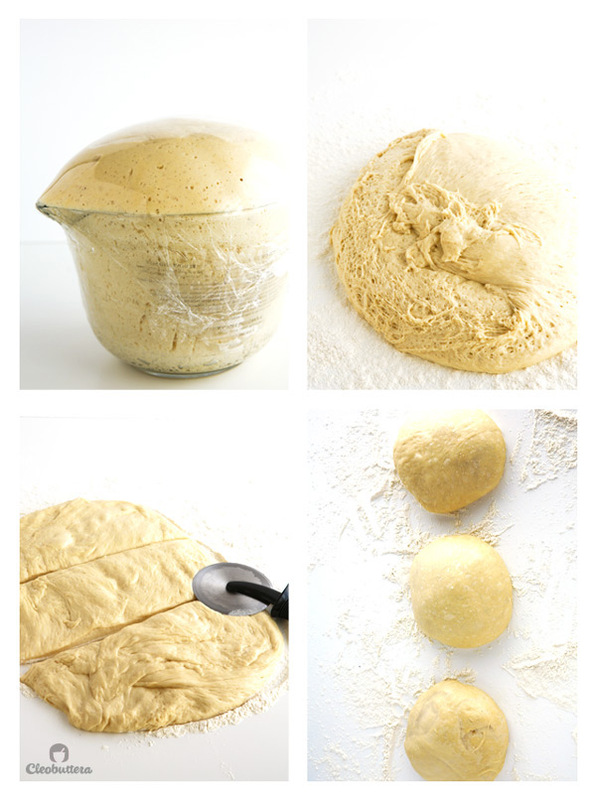 If you want to only make the dough on day 1 then don’t rise; refrigerate right after kneading. It will have a brief cold rise in the fridge then allow to finish rising the next day. I think it might just turn out fine, but overproofing may result in an overly yeasty or fermented flavor. Just make sure that the surface of the dough is well oil so it doesn’t dry out. 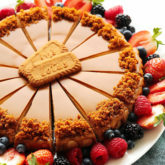 Hellooo i am from Myanmar, I am opening a small bakery very soon and currently trying to work on different recipes. I would like to know if that tangzhong method works on any flour or does it have to be an excellent quality one? I haven’t tried it but with the bread recipes I tried before, the bread turned out fine but not soft and fluffy and I am looking for ways to make it soft, just like the ones in the pictures. I even thought that using chemicals was the only way to make it soft. Please help me. Congrats on the bakery! That’s so exciting. The tangzhong method can be translated into any dough recipe and works with all types of flour. It definitely helps with the fluffiness. I’m not really sure what professional bakeries use, but it’s possible that they could be using enhancers to increase the shelf life of their products. Best of luck! 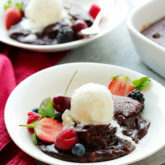 how do i halve this recipe..? 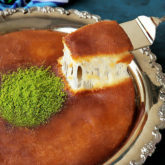 i dint want to make with 5 cups of flour..
Hello Thahseen! If you have a digital food scale, I’d recommend dividing the gram amount by 2. It’s the easiest and most accurate method. 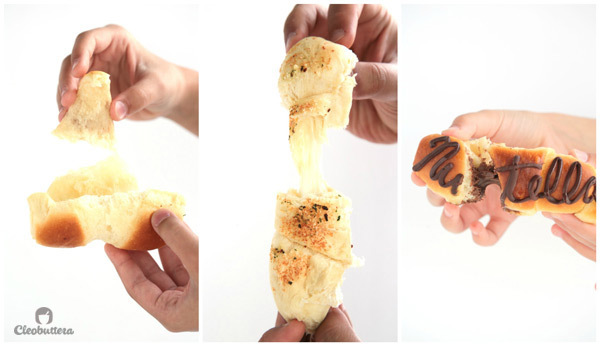 thank you so much for this super easy recipe – off to make another batch of these amazing rolls! by the way- love your blog…your photos are so beautiful! Can i freeze the filled rolls 2 days ahead and take tjem them out for second rise before baking it? Hi Walaa! I hope you had a wonderful Eid too! So sorry for my late reply; it’s been a crazy month. Yes…you most certainly could freeze them at this stage. Best of luck! Hello, can this recipe work for a soft margarita pizza for kids in their lunch box? 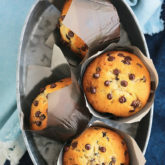 I can’t wait to try this recipe, just one question: can I freeze some rolls after baking ? Hi Nisrin! Sure! Stored in freezer zipperlock bags, leftovers will freeze well.